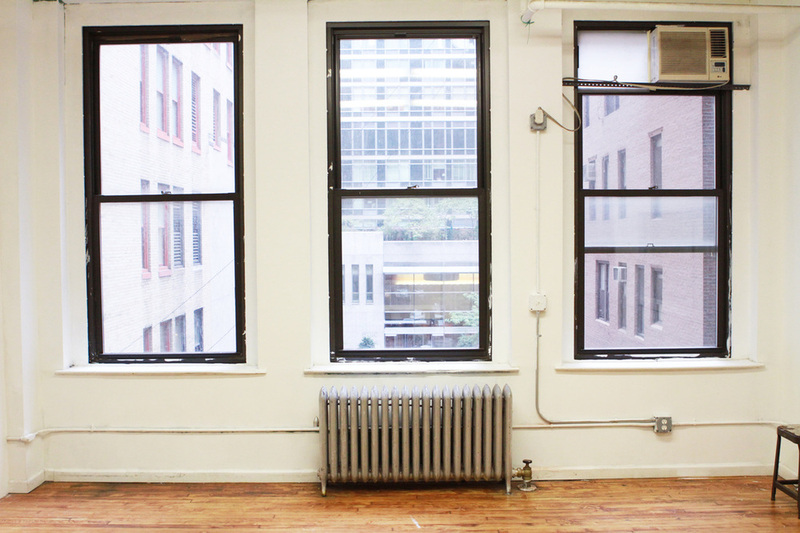 Studio #1 is the perfect intimate and comfortable photo rental space for creatives in NYC. Fully equipped with seamless setup, hair and makeup stations, wifi, iPod hookups, racks, tables, and chairs. The space can comfortably fit groups of up to 6-8 people while still leaving plenty of space to work. Clients in the past have used the space for e-commerce, fashion, editorial, look books, commercial, catalog shoots, small castings, and video interviews. The space boasts hardwood floors, all white walls, 12-foot ceilings and three large windows letting in plenty of sunlight. Shoot with natural lighting or block out the windows and use our Profoto lighting kits. We have a large range of equipment included with your booking and available for rent. Our studio is open 7 days, 10am-6pm. If you'd like to book outside our normal studio hours, no problem — just give us a call. * Not included with 2-hour rentals. Seamless is $25 per pull. We include one pull for rentals over two hours. We have additional equipment available for rent. Check it out here.